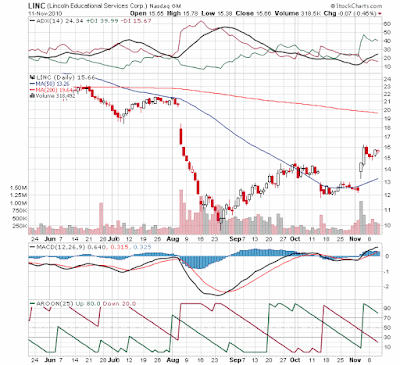 For-profit education stocks -- throwing Lincoln Educational Services out with the bathwater? You may be a aware of some of the controversy surrounding for-profit schools like Apollo Group's University of Phoenix. The U.S. Department of Education intends to review financial-aid practices at the school. Many for-profit education companies face federal scrutiny because almost 90 percent of the companies’ revenues derive from funds from the Title IV federal aid program. Many of these funds are disbursed to the schools as government-guaranteed student loans. Essentially, the schools can't lose if students fail to finish their degree programs or default on the loans. The schools have been accused of marketing too aggressively to sign up students and get their hands on the Federal student loan money with little regard for the students or their potential to actually benefit from the programs being offered. The difficulties many students have in obtaining the jobs the schools led them to expect has also led critics to contend that the for-profit schools are simply in business to obtain Federal loan dollars. By virtue of being on the Growth and Value Report, the company needed to register year-over-year growth in earnings and revenue as well as sequential quarter-over-quarter growth. Lincoln was able to deliver that kind of performance. As a result of the sell-off in the whole for-profit education sector, Lincoln's valuation has been driven deeply into value stock territory. At this point, the PE is less than 6, PEG is less than 0.6, Price-to-Sales is merely 0.61 and Enterprise Value/EBITDA is a paltry 2.73. These numbers are characteristic of very deep value. Not only is the valuation attractive, but other financial measures are notably good. With the combination of Return on Assets over 20% and Return on Equity over 31% management effectiveness appears to be solid. 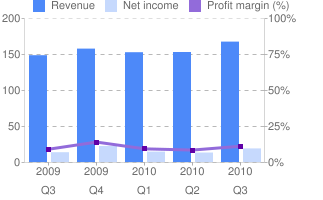 Net Profit Margin of nearly 11% is almost twice that of the sector. Price to Cash Flow is roughly three times better than that of the sector. As alluded to above, enrollment counselors have in some cases been accused of over-promising the benefits of attending these for-profit schools and also of enrolling less than qualified students who have little chance of do well. With the jobs students expect failing to materialize, the student is left owing money on their student loans and facing serious difficulties in making the payments. Ultimately, the taxpayer is left holding the bag if the students default. The schools, however, are left relatively unscathed though a school may lose its eligibility to receive federal financial aid under certain Title IV programs if its Cohort Default Rates (CDRs) exceed specified percentages in the 25% to 30% range. The question is, should Lincoln Educational Services be considered one of the major offenders in this game of roping in students just to harvest the student loans? The company says its 2-year CDRs range from 8.69% to 13.42%. Unfortunately, regulations have changed and now 3-year CDRs are being used. The company's CDRs are not so good for this extended evaluation range; however, the company has said that the new regulations will mean that they will stay more involved with the students for a longer time. Lincoln intends to actively work with former students in danger of defaulting during the 3-year measurement period in order to help them manage their outstanding loan commitments and to counsel them on alternatives to meet their financial obligations. Also, Lincoln is different from University of Phoenix, for example, in that Lincoln tends to focus on training for fairly down-to-earth professions rather than offering degrees like liberal arts or communications. This should tend to make graduates more employable as they enter the job market with more specific skills. So have investors thrown the baby out with the bathwater? Lincoln Educational Services is clearly cheap at current levels, their earnings and revenues are growing and, after seeing the stock plunge, positive momentum is now building. That momentum suggests that the fear of government scrutiny may be over-done with respect to Lincoln Educational Services. Which all implies this stock is a buy.